It can be but IMO because the engine cross member is not removable it is actually more difficult than removing the engine. I have done it. You still have to raise the engine a little. Cant remember how much, but one to two inches. Per Tony-muscle, You can when you disconnect or remove the long stud that connects the upper and Lower engine mounts. You will have to jack up the motor just enough, drop oil pan, then disconnect oil pump. The engine will need be to high enough to clear the crankshaft lobes. It is not easy. It can be done. Make sure you have good jacks and lifts. Safety is number one concern when doing this! 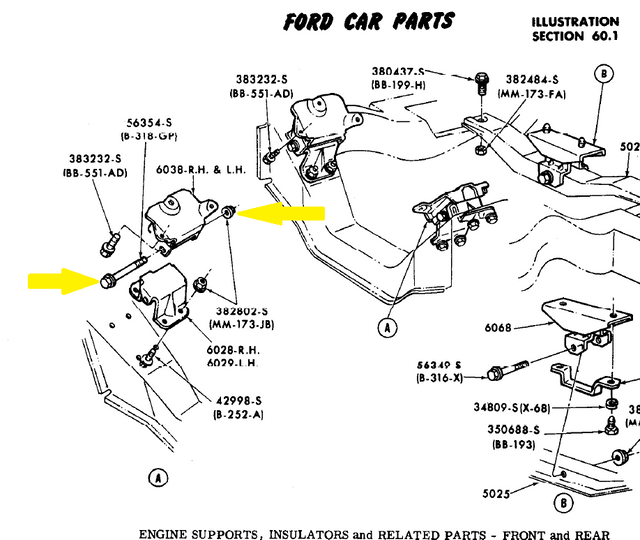 One of Ford's more brilliant ideas: change the engine cross-over brace from bolt-in to welded in, making access to the bottom of the engine extremely difficult. I guess the few pennies saved by welding vice using bolts was worth it, eh? I've done it on a 302. When I've pulled oil pans, with the engine in the car, I've found the hardest part was getting the oil pump and drive shaft back in and the gasket back on. Getting enough clearance was a problem a couple of times, when the bellhousing or heads hit the firewall. I've given up on trying it, just don't like laying on my back under the car with oil and dirt dripping down on me. It's just easier, and cleaner, to remove the engine. And, it's more likely it will be reassembled correctly. Also a good time to check the bearings. Just because it hasn't been run much in the last 10 or 20 years doesn't mean they are still good. Engines that aren't run much get a lot of condensation, which can settle in the bearings and pit the bearings and crankshaft. The shop manual instructions for removing the oil pan mention removing the crossmember bolts. This in addition to removing the starter and sway bar. It doesnt say anything about having to raise the engine although from reading here it sounds like you have to. Is this just for 72 and 73 and 71 crossmember is not welded? (02-14-2019, 04:45 PM)SteveO_71 Wrote: The shop manual instructions for removing the oil pan mention removing the crossmember bolts. This in addition to removing the starter and sway bar. It doesnt say anything about having to raise the engine although from reading here it sounds like you have to. I have also read that in the manual but it is wrong. Our crossmembers are welded. I wished they would have been designed to be bolted. For those of you that aren't familiar, much of the 71-73 Mustang front subframe was sourced from and common with the 68-71 Torino. Best advice I can give for in-car pan replacement, is to glue the new pan gasket to the block with Permatex gasket adhesive or Indian head gasket shellac. Run some bolts in to hold the gasket in place while it dries.